Yep, it's a Mustang all right. The seats are comfortable, and the throwback interior styling still seems fresh. 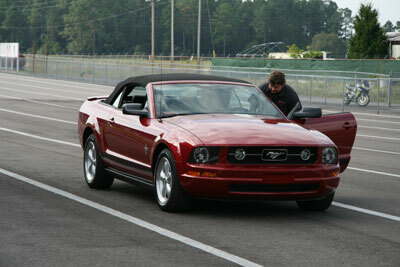 GRM Associate Publisher Joe Gearin did our official quarter-mile testing. He thinks more traction could produce a better run. The car looks better with the top down, but sometimes it rains. Somewhere under all that plastic, there's a 210-horsepower V6. It seems like lately, every press vehicle that has arrived at our office has been served with an automatic transmission. You can imagine our delight when we saw that our latest test subject was equipped with a good old-fashioned clutch pedal. 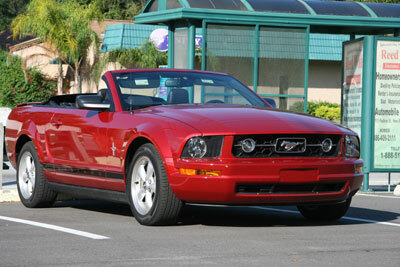 As a sporty convertible, the Mustang works well for short trips and relaxed drives around town. The V6 provides enough power for commuting, and its engine produces a terrific note, especially considering that it's two cylinders shy of its big brother. 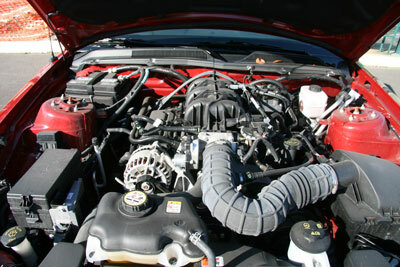 Earlier Mustang convertibles are plagued with cowl shake when they encounter expansion joints and uneven pavement, and that issue hasn't entirely disappeared from this car. 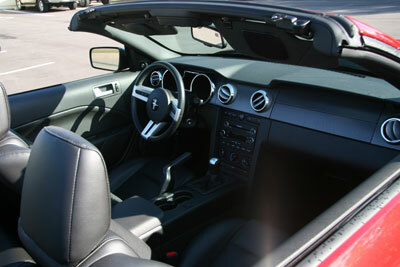 For the most part, however, the Mustang V6 is an easy, comfortable cruiser. If you can't spring for the big, bad GT model, the V6 offers most of the look, sound, and feel for about five grand less. Here's an interesting tidbit of info: The latest Mustang V6 engine makes about as much horsepower as the once all-mighty 5.0 V8. True, the Mustang has put on about 500 pounds since then, but that's still fairly impressive. 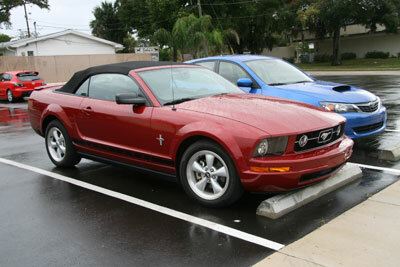 Looking at this Mustang as a nice, fair-weather cruiser and not a Solo crown contender, the setup was nearly perfect. The V6 was capable, the five-speed quite nice, and the Shaker 500 stereo had plenty of thump. Throw in the convertible top and satellite radio, and it was the perfect car for a fall day here in Florida. I know most of our readers are more into go than show, but I also dig the Bullitt-style wheels and grille-mounted lamps. Good or bad, the latest Mustang still feels like a Mustang. After spending a few days (and a few hundred miles) behind the wheel of this Mustang, it's easy to see why they are such big sellers. Great looks, a nice gearbox/ clutch relationship and decent torque make this Ford a pleasure in day to day driving. The chassis isn't the most solid with the top down, but it never bites you, and faithfully does what it's told. The interior plastics seemed a bit cheap at first, but after a few miles of top down driving I forgot all about the parts-bin pieces and really started to enjoy the car. The V6 feels and sounds OK, as long as you are at 1/2 throttle or less. At higher RPM's this powerplant fails to inspire, but that's why there is a V8 available. Sure $30K isn't chump change, but this Mustang was pretty loaded up with heated seats, power everything, and of course those goofy dash and cupholder lights that you can change between 8 or so settings. This overall package is nice enough to inspire real car lust--for the V8 model.